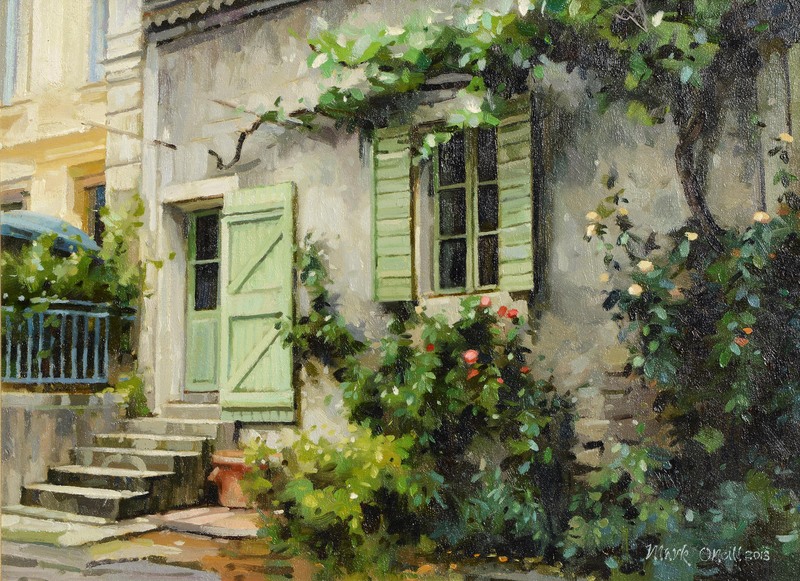 An online art auction is currently underway at Morgan O’Driscoll. 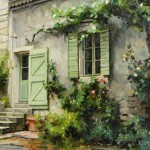 There are 220 lots of highly affordable Irish art on offer. It concludes on September 9 at 6.30 p.m. Everything is online at www.morganodriscoll.com Here is a small sample (click on either image to enlarge). 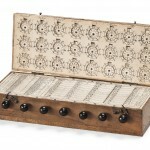 The pocket sized 1678 arithmetical machine. (Click on image to enlarge). 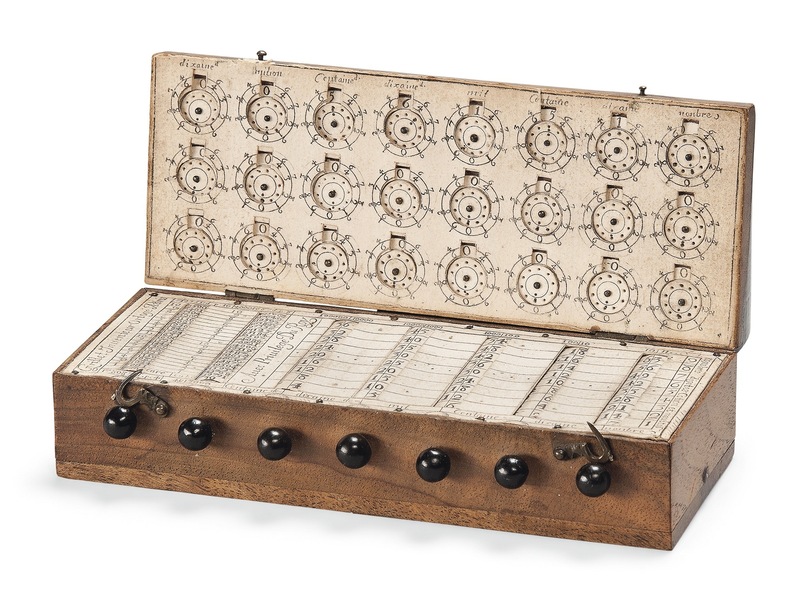 A precursor to the computer, one of the earliest surviving pocket calculators, comes up at Christie’s bi-annual sale of Travel, Science and Natural History in South Kensington, London on October 10. Made around 1678 by watchmaker Rene Grillet de Roven it is one of the earliest mechanical calculating devices known to exist and the first portable device. Only three other known examples of this design survive. It is estimated to make £70,000-100,000. A range of fresh to the market pieces will come up at Sotheby’s Fine Chinese Ceramics and Works of Art sale in Hong Kong on October 8. The selection is led by two collections of Chinese art from Japan, Chinese Art Through The Eye Of Sakamoto Gor? 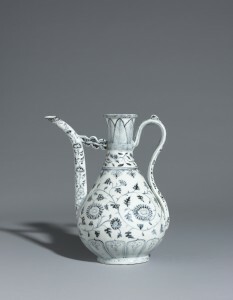 and Imperial Qing Porcelain – A Kyoto Collection, that have remained unseen for more than half a century. 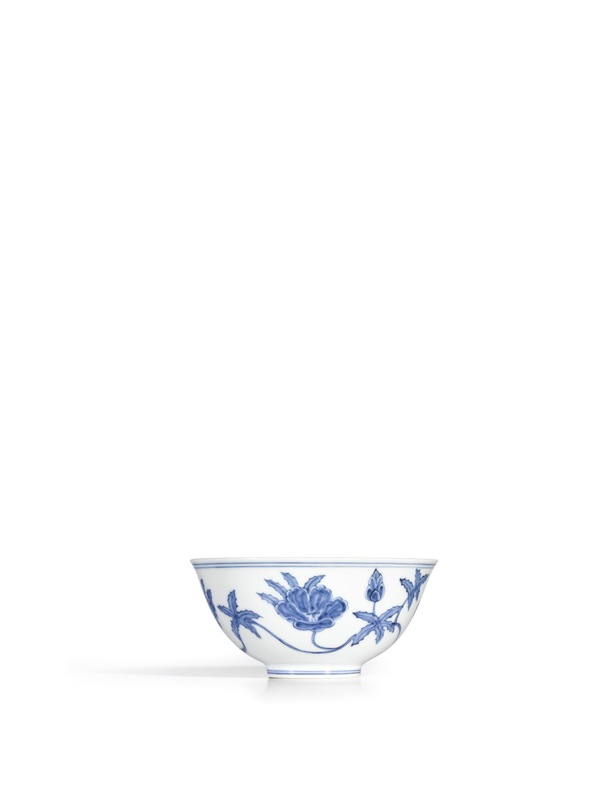 The series will also highlight the single-lot sale, The Cunliffe Musk–Mallow Palace Bowl as well as an extraordinary set of seals used by the Qianlong emperor before he ascended the throne. More than 400 lots have an estimated total value of nearly US$100 million. Here is a small selection, click on any image to enlarge it. 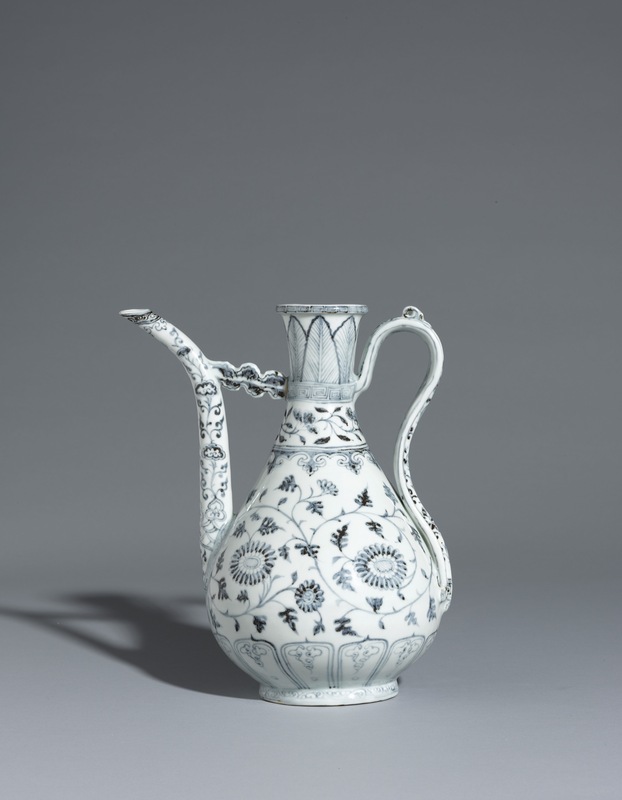 A blue and white ewer, Ming Dynasty, Hongwu Period US$1.9-2.6 million. 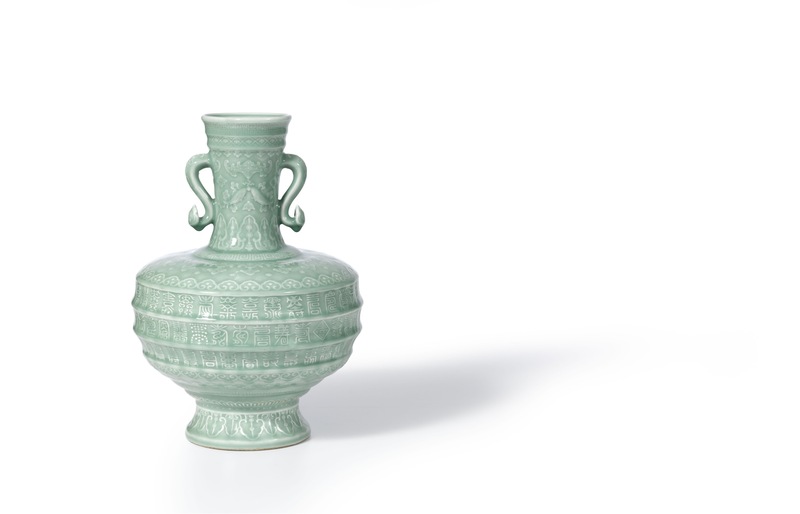 A celadon glazed longevity Ruyi handled vase, Qianlong US $1.3-1.5 million. 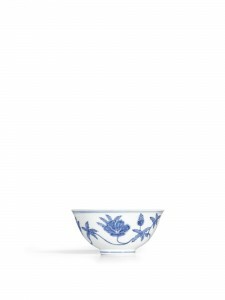 The Cunliffe Musk Mallow palace bowl, mark and period of Chenghua US $10 million plus. THE centenary of the 1913 Lock Out will be marked at Whyte’s auction of History, Literature and Collectibles in Dublin on September 14. It is exactly 100 years since Ireland’s most significant industrial dispute began in August 1913. It went on until January 2014. 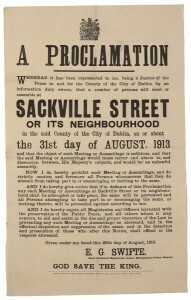 Lot 253 in Whyte’s auction of 745 lots is a scarce Dublin Metropolitan Police proclamation banning a meeting at Sackville Street or its neighbourhood on August 31, 1913. It warns that “… such meeting or assemblage is seditious and that the said meeting or assemblage would cause terror and alarm to, and dissension between, his Majesty’s subjects, and would be an unlawful assembly”. It was issued by E.G. Swifte, Chief Divisional Magistrate and is estimated at 1,000-1500. Lot 254 is a pair of National Seaman’s and Fireman’s Union membership booklets issued to Richard Dunne. They show membership payment stamps from 1913 to 1916 with no stamps for the weeks from September 15 to November 3 1913. This period is overwritten in ink: “8 weeks allowed Lockout”. The booklets are estimated at 300-500. The sale covers a time span from 50-60 million years BC with a basalt section from the Giant’s Causeway to the unique Irish Masters Snooker Trophy last awarded in 2007. UPDATE: The Proclamation sold for 900, the union membership books for 620. Mount Saint Vincent Convent, Limerick. 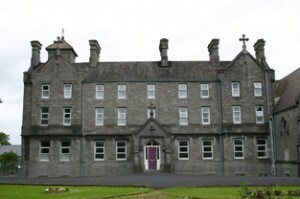 Convent sales are becoming more rare in Ireland. In the 1990’s they were a regular feature as convents and monasteries around the country downsized due to dwindling numbers. Nowadays there are not so many but O’Donovan and Associates of Newcastlewest, Co. Limerick will offer a clearance auction of the contents of Mount St. Vincent Convent, O’Connell Avenue, Limerick on August 31 at 11 a.m. Viewing is from 9 a.m. the day of the sale. Alongside antique and period furniture there will be statues, pedestals, church pews, industrial washing machings and some prints. All lots are to be sold without reserve. 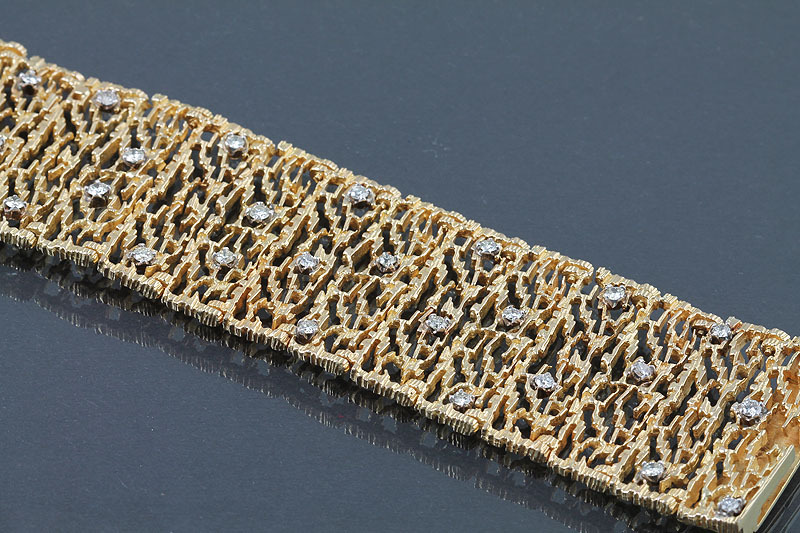 An 18 carat gold wide bracelet , mesh link by West of Dublin, set with diamonds (4,000-5,000). 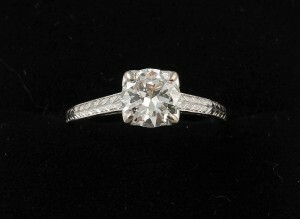 A solitaire diamond ring (7,000-8,000). 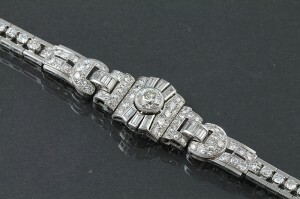 A 1930’s diamond bracelet of circular design (17,000-18,000). RENÉ MAGRITTE (1898–1967) PRIMAVÉRE -courtesy Christie’s Images Ltd., 2013.
silkscreen, 1960. Courtesy Christie’s Images Ltd., 2013. More than 100 vintage posters exploring graphic design from 1894 to 1988 will feature at Christie’s, South Kensington, London on October 2. Graphic Masterworks; A Century of Design is a collection put together over 40 years by Martijn Le Coultre. 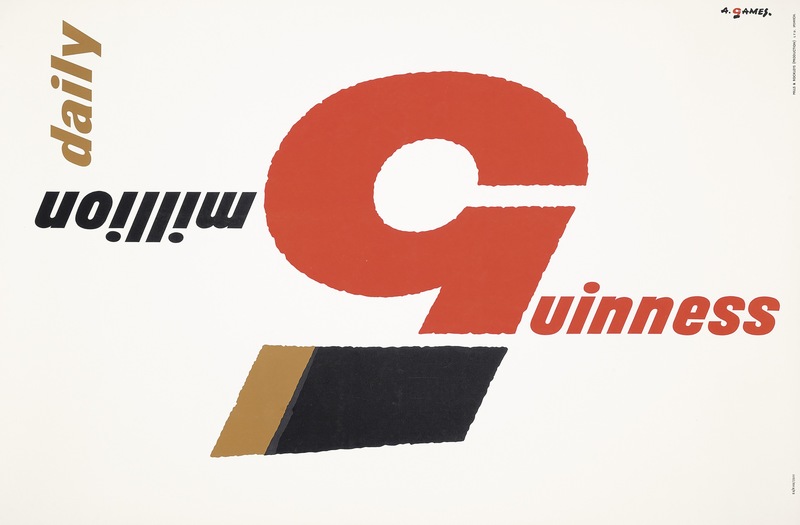 It includes artists at the forefront of avant-garde art and design known for their revolutionary use of typography, layout and colour and their impact on the De Stijl, Bauhaus, Constructivism and Expressionism movements. With estimates ranging from £1,000 to £200,000, the sale offers a unique opportunity to acquire rare and groundbreaking graphics. Art Deco posters included in the sale such as René Magritte?s Primevère poster (£12,000 – 16,000), shows the development of advertising in more lavish design. 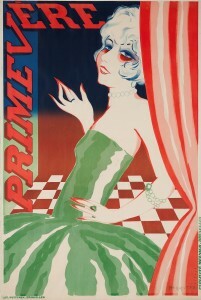 This one dates to 1926. Following the Second World War, dramatic changes in technology, consumer desires and an increasingly competitive market greatly influenced the advertising industry. Posters had to convey a multitude of messages and designers were required to think conceptually, as well as aesthetically. Abram Games’ Guinness 5 Million Daily (£1,000 – 1,500) conveys his philosophy on design: “maximum meaning by minimum means”. (Click on either image to enlarge). Normally the sale of a corporate art collection is signalled well in advance. Not so in the case of the former Anglo-Irish Bank, which has cost the Irish taxpayer an estimated 25 billion. The banks collection is to be sold with what appears to be undue haste. 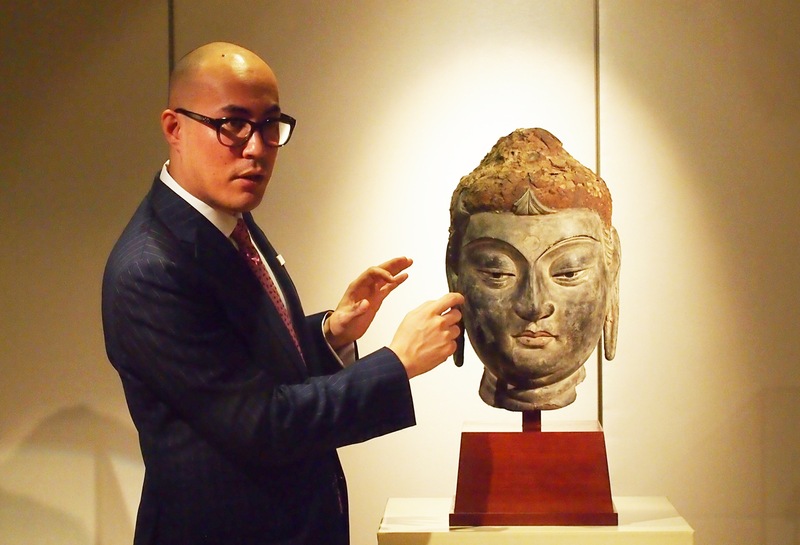 Auctioneers James Adam will conduct the sale in Dublin on September 3. This has only just been announced. Estimates, which range from 50 to 12,000, are on the low side. 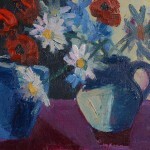 On offer are 134 works by Stephen McKenna, Louis le Brocquy, Pauline Bewick, Felim Egan, Martin Gale and other artists. The entire collection is worth an estimated 150,000. 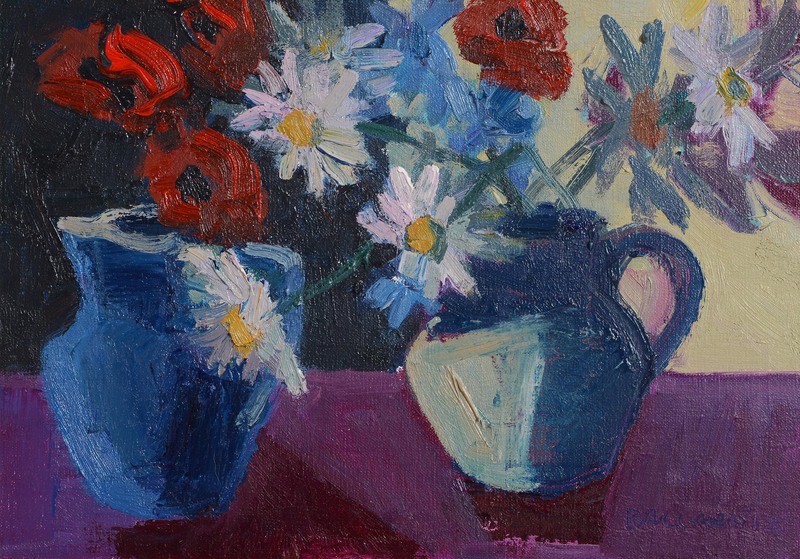 Anglo previously donated 18 artworks to the Irish Museum of Modern Art. After its collapse it was re-named the IBRC. It was put into liquidation in February and the sale is being carried on the instructions of the liquidator, KPMG. A question mark remains over the wisdom of putting a collection which includes many leading Irish art names on the market at this short notice just before the autumn selling season proper for Irish art gets underway. 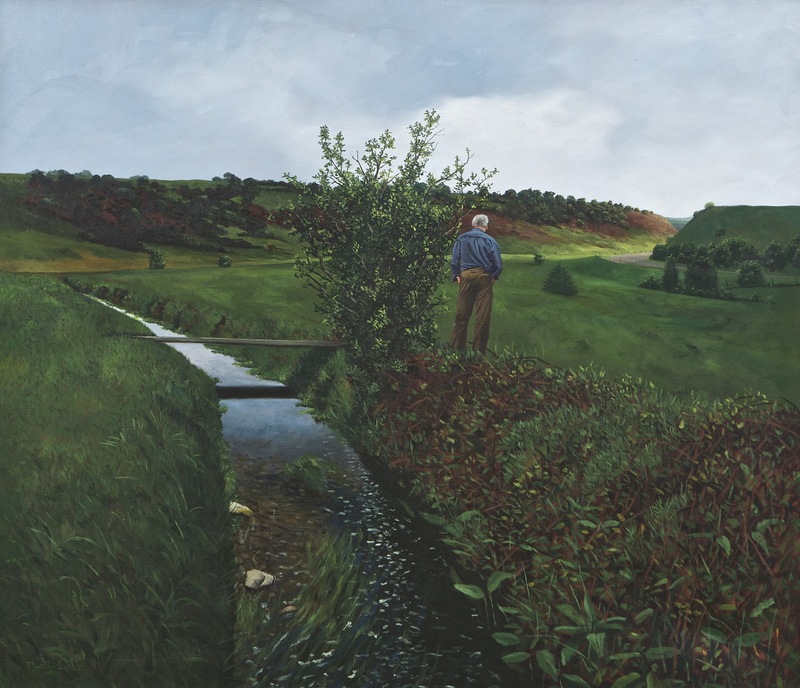 Ireland remains mired in recession and the Irish art market, though it has shown itself to be suprisingly resilient, cannot be described as buoyant right now. Here is a small selection. The catalogue is on-line. UPDATE: A total of 93 per cent of 134 lots sold and achieved 281,000, twice the expected minimum. 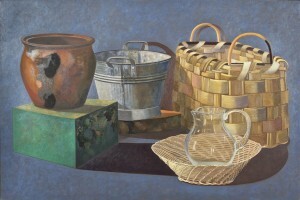 The highest price of 17,000 was paid for Stephen McKenna’s Basket and Vessels.The six paintings by Pauline Bewick, depicting Irish wildlife made a combined total of €44,900. Sean Scully’s etchings all sold well over estimate with his ‘Raval No 1’ making the top price of €6600. 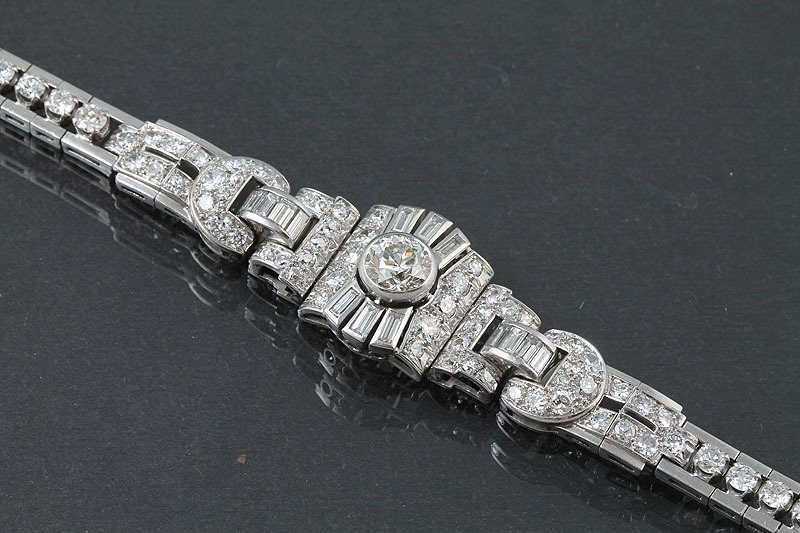 The salesrooms was packed with over two hundred bidders for the entire duration of the sale with enthusiastic and good natured bidding all round. Phone and internet bidders competed with the attendees. Martin Gale RHA (b.1949) His Land (5,000-8,000). 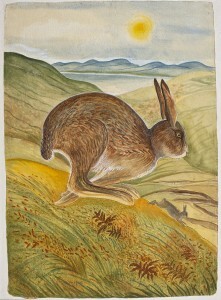 Pauline Bewick (b.1935) The Irish Hare Acrylic (3,000-5,000). Stephen McKenna PRHA (b.1939) Basket and Vessels (8,000-12,000). 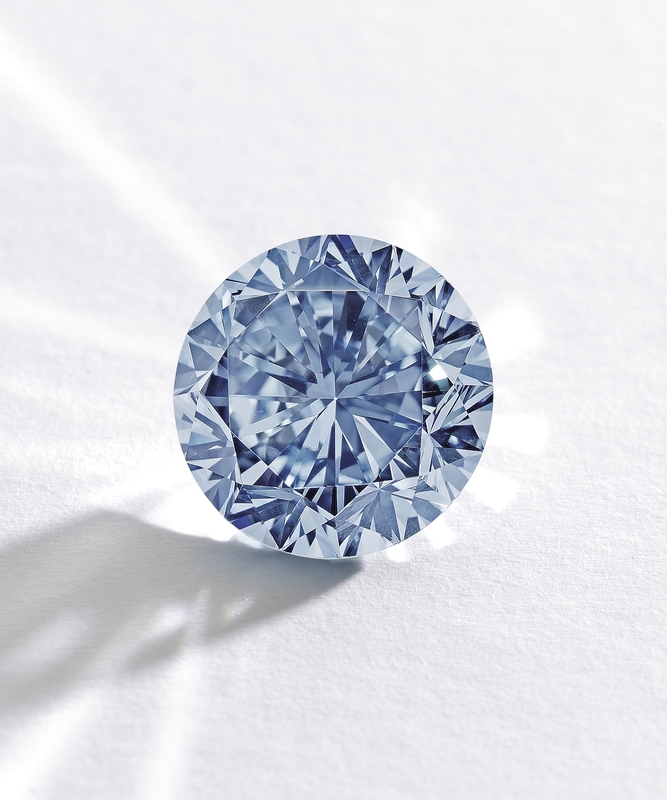 The Premier Blue, a 7.59-Carat Round Brilliant-Cut Internally Flawless (IF) Fancy Vivid Blue Diamond. (Click on image to enlarge). THE Premier Blue, the largest round fancy vivid blue diamond ever graded by the Gemological Institute of America, comes up at Sotheby’s in Hong Kong on October 7. The internally flawless 7.59 carat stone is rare and exceptional. Widely applied to white diamonds, the round brilliant cut is rarely used in coloured diamonds due to the high wastage involved in the cutting process. No significant round fancy blue diamond has ever appeared at auction worldwide. It will be previewed around Asia and in Geneva, London, New York and Doha. 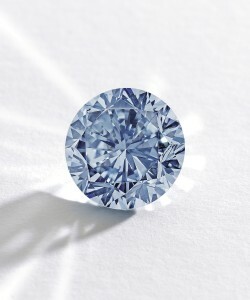 Quek Chin Yeow, Sotheby’s deputy chairman in Asia, said: “Sotheby’s has been entrusted with many important blue diamonds and holds the current per-carat price record for Fancy Vivid blue diamond at auction (with the sale of a 6.01-carat Fancy Vivid Blue Diamond which achieved US$1,686,505 per carat in Hong Kong in October 2011). This Autumn we are thrilled to offer the Premier Blue”. Sotheby’s say the Premier Blue offers an unprecedented collecting opportunity for connoisseurs worldwide. Cygan the robot at Christie’s. The Out of the Ordinary sale at Christie’s in South Kensington, London on September 5 lives up to its name. The 155 lots on offer span eras from the prehistoric natural world to science fiction. 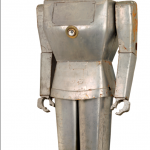 Among them is Cygan, an eight foot high robot made in 1957. 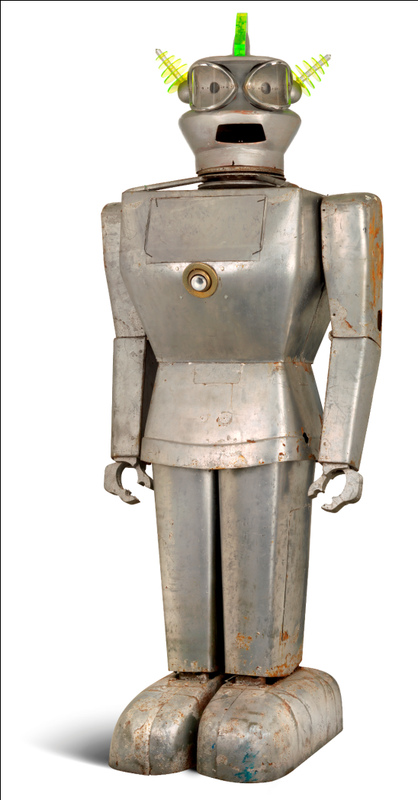 At that time it was one of the most sophisticated robots in the world, with an ability to accept spoken commands and respond to light rays. 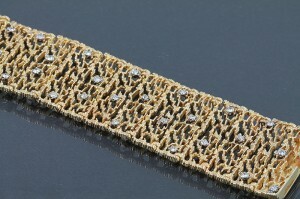 It is estimated at £8,000-12,000. Adult Females Attack Without Provocation by the late photographer Bob Carlos Clarke is estimated at £7,000-9,000. 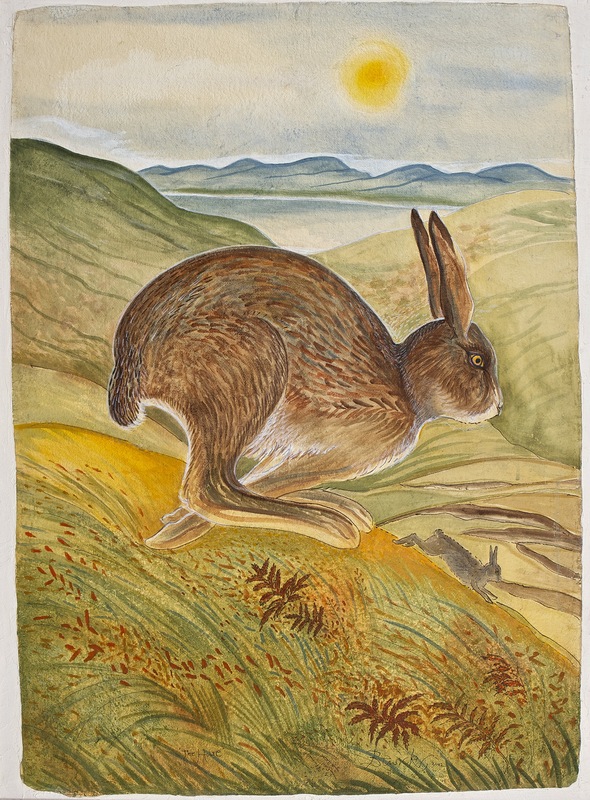 An extended exhibition to preview the auction is currently running at Christie’s in South Kensington. (Click on either image to enlarge it).